We’d love your help. 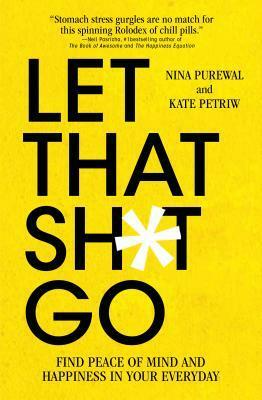 Let us know what’s wrong with this preview of Let That Sh*t Go by Kate Petriw. Life is stressful as f*ck. But it doesn’t have to be. It’s no wonder you can’t calm down: your to-do list is as long as your arm, your bank balance keeps dropping, you feel guilty for not calling your parents more often and there always seems to be a big deadline to meet at work. You need a serious breather—but you can barely find time to shower, let alone to exercise or me Life is stressful as f*ck. But it doesn’t have to be. It’s no wonder you can’t calm down: your to-do list is as long as your arm, your bank balance keeps dropping, you feel guilty for not calling your parents more often and there always seems to be a big deadline to meet at work. You need a serious breather—but you can barely find time to shower, let alone to exercise or meditate. To ask other readers questions about Let That Sh*t Go, please sign up. Like all excellent self-improvement books, "Let That Sh*t Go" includes many perspectives and techniques (over 100) to help you be your best self. Each of the nine chapters is a lens through which to assess how to manage what you can and can’t control to experience calm and happiness within. This book helps you assess areas where you are strong and those that need development. Negative self-talk (from my "chatty mind") is my biggest challenge. Although I have read a lot on the topic, the authors' Like all excellent self-improvement books, "Let That Sh*t Go" includes many perspectives and techniques (over 100) to help you be your best self. Each of the nine chapters is a lens through which to assess how to manage what you can and can’t control to experience calm and happiness within. This book helps you assess areas where you are strong and those that need development. Negative self-talk (from my "chatty mind") is my biggest challenge. Although I have read a lot on the topic, the authors' explorations and perspectives are the clearest and most engaging. Their practical and simple techniques are building my capabilities daily. Nina and Kate's writing style is conversational, supportive and fun. I appreciate the personal examples of challenges they have faced and reflections on using the techniques. Their stories inspire confidence and action. "Let That Sh*t Go" is an excellent resource for anyone who wants to gain greater calm, focus and happiness by releasing the limiting stuff they are holding onto. It's helping me be the best version of myself, and I hope it helps you too. This is not a bad book. But it goes on and on and on! They should rerelease a condensed handbook as the contents in this book was great.